Download a convenient object remover and save your pictures! Have you ever taken a great shot that came out ruined by a tiny flaw? It’s a familiar story and even the best of us can’t always avoid situations when a perfect scene is interrupted by a sudden car driving in the background or dust that got on the camera lens. The list of such nasty stuff can go on forever, including unsightly pimples on the face, dirt on the subject’s clothes, the tip of your finger visible in the photo or a garbage bin spoiling the atmosphere of your shot. How to remove something from a picture without affecting its other parts? PhotoWorks software is your perfect choice in this case. 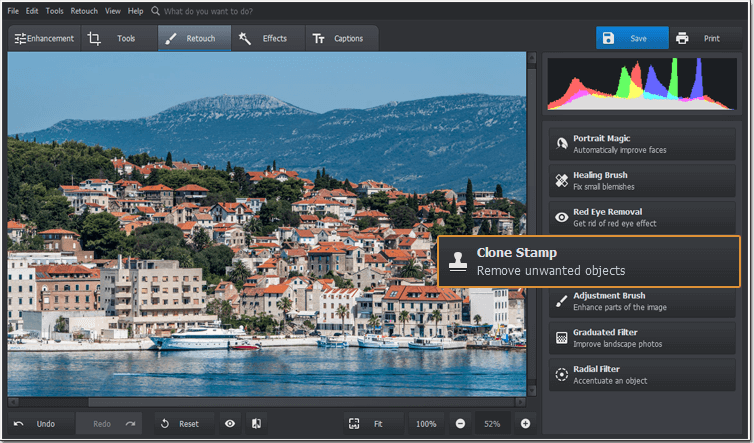 This photo editor offers you two powerful tools to delete all kinds of unwanted objects with minimum efforts - the Healing Brush and the Clone Stamp. Keep reading this guide and you’ll learn how to improve your photos using both of these adjustment tools to your benefit. Launch PhotoWorks on your computer and move to the Retouch tab. There you’ll find plenty of tools for editing your portrait and landscape shots. 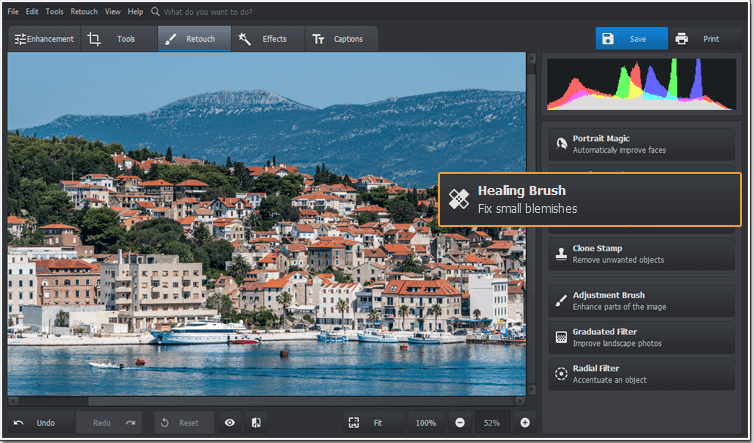 Click the Healing Brush button to get rid of tiny imperfections and fix small flaws. Keep in mind that this tool works better on smooth and uniform textures and can conceal skin blemishes, smudges, dust spots or other small-sized items. 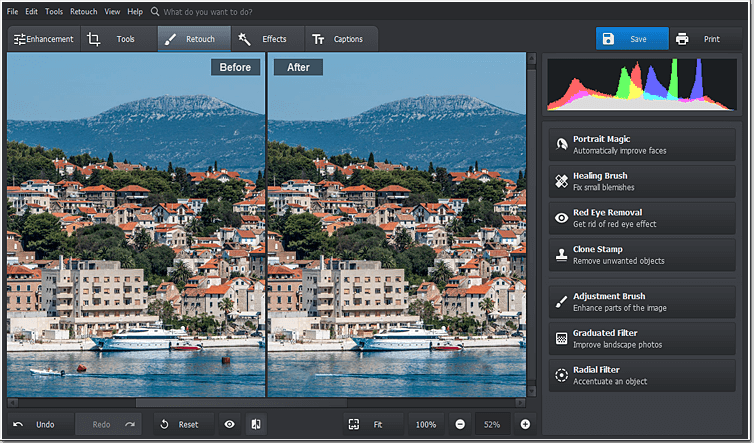 Zoom in your photo by clicking the plus button at the bottom of the program window to take a good look at all the imperfections you need to erase. Set the proper brush size to save only the chosen area and leave the rest of your picture as it is. Don’t forget to adjust the Feather and Opacity settings to automatically blur the edited parts and achieve a more natural look. After applying this object removal tool to your ruined photo hold the Show Original button and you’ll instantly see all the places where the Healing Brush has concealed imperfections. Otherwise, you can click Before / After and the program will show you both the initial and the edited shot side-by-side to better compare them. The Clone Stamp is another type of an object eraser available in PhotoWorks. 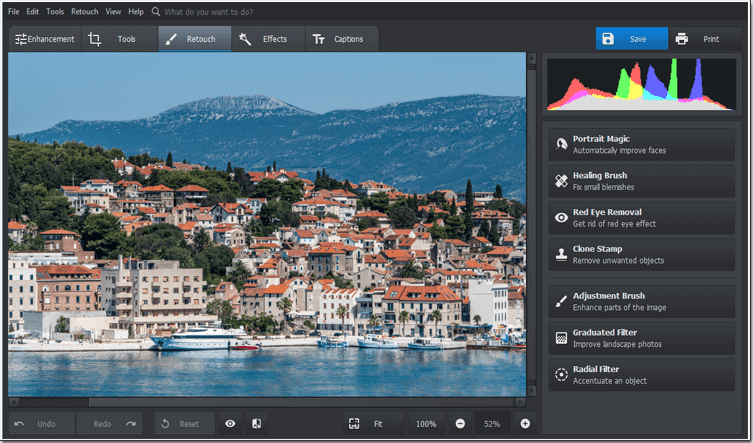 It lets you move, remove and duplicate entire areas of your photograph to delete large distracting elements. The tool borrows some pixels from an adjacent area and places this sample over the damaged pixels. While on the Retouch tab, push the Clone Stamp button. The good news is you can use it alongside the Healing Brush. To completely erase unwanted objects from your picture, adjust the brush size of the Clone tool to edit only the chosen area. If needed, change the opacity and feather settings to soften the edges of the edited zone and merge it with the rest of your photo. Place the mouse pointer over the thing you need to remove and carefully paint over it. The program will outline the ‘donor’ area. If the edges of some objects are still visible, simply rearrange the source area to fully conceal the undesired element. Didn’t find the solution to your photo problem? 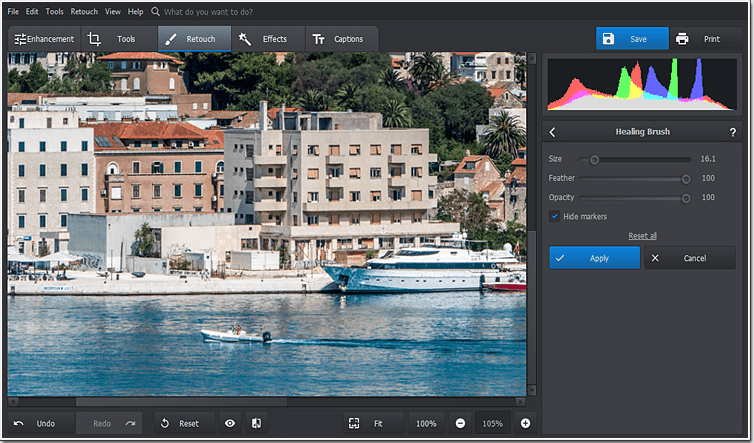 PhotoWorks offers other helpful tools to edit something out as if these undesired things have never been on your pictures. Below we present another go on the problem of photos ruined by unwanted objects. A great alternative to concealing imperfections and removing odd objects is simple cropping. If you have an undesired element closer to the photo edge, you can easily crop something out. Switch to the Tools tab and click the Crop button. Set the necessary aspect ratio and choose a suitable grid overlay (the Golden Ratio, the Rule of Thirds, or others) to focus on the main subject and leave everything else beyond the picture border. PhotoWorks offers you a unique face editor that does a fine job concealing such skin problems as blemishes, moles, glare and redness. Move to the Retouch tab and hit the Portrait Magic button. The program will provide presets for quick one-click enhancement. If you want to edit your portrait shot manually, just switch to the Custom Settings tab and drag the sliders to smoothen skin, decrease glare, get rid of redness, accentuate lips and eyes. 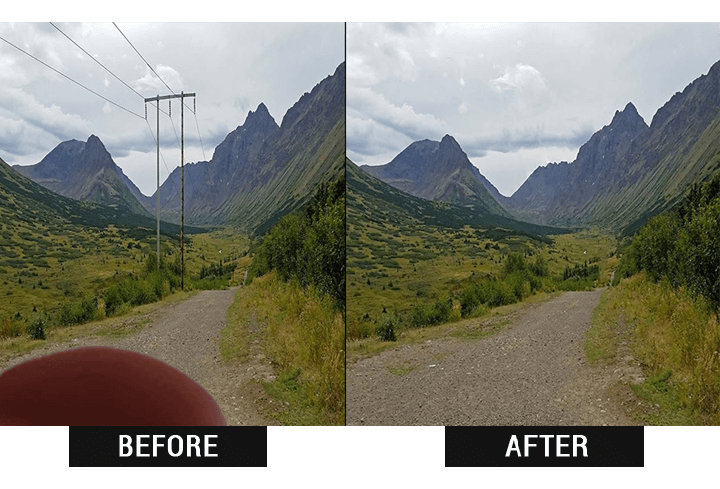 Of course, you can remove unwanted objects from your photos using free online editors or mobile apps but it’s easy to lose your edited image due to bad Internet connection or your smartphone failure. 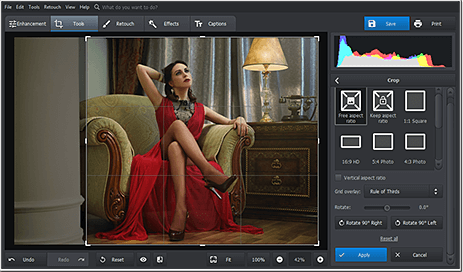 PhotoWorks software guarantees you stable and non-destructive image editing. 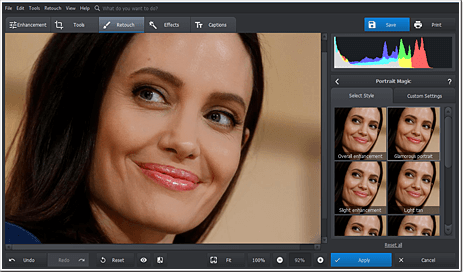 Following easy photo editing tips, you will surely get rid of all unwelcome details like ugly things in the background, emojis added to your photos in social networks or skin blemishes that cannot be concealed with make-up. 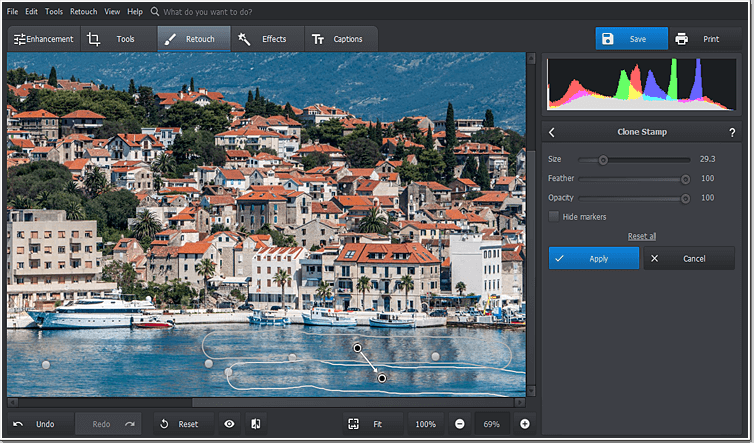 With such a powerful image editor, you won't need to learn how to blur a picture for a creative effect or highlight the chosen colors without affecting the others, the software will do the task for you!